The classic Batman series still isn’t available on DVD so fans have had to be satisfied with the 1966 feature film . 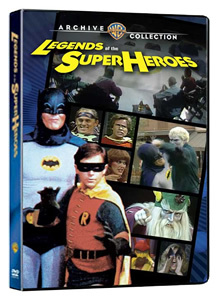 Now, it’s possible to purchase another product that features Adam West and Burt Ward as Batman and Robin, as well as Frank Gorshin as The Riddler. Back in 1978, Hanna-Barbera produced a pair of live-action comedy specials called Legends Of The Super Heroes . In “The Challenge,” the dynamic duo, Captain Marvel, Green Lantern, The Flash, Hawkman, Black Canary, and The Huntress must work to stop a band of villains from destroying the world. In the second special, the heroes are the target of a good-natured roast that’s hosted by Ed McMahon. This is the first time that these specials have been released on DVD and the quality is quite good for projects that were video-taped. The Warner Bros. Archives DVD also contains several minutes of unused footage from both specials. You can purchase Legends of the Superheroes or you can also try to win a copy here. To enter, you need to merely post a comment below.You can enter once per day. Guidelines: This giveaway is open to participants with a United States mailing address only. (International readers can enter if they have a friend in the States who can accept their prizes by mail.) Many may enter but one person will win. You must be 18 and older to enter and no purchase is necessary. Contest ends December 20, 2010. UPDATE: Congratulations to “Gray D.” who won this DVD set in our contest. Thanks to everyone who played and we’ve got more contests coming! These are pretty bad but I love them!! Entering the contest. Would really love to get this!